October is ‘Vegetarian Awareness Month’ and I figured I better take advantage of it before the month is over in 2 days. Green is the thing – businesses are going green to save energy – but Green Food in the form of Vegetables is great too. So here are a few ways to use Cauliflower – not the common white variety but, yes Green Cauliflower. 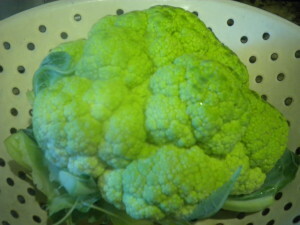 Not only does Cauliflower appear in Green Form but there is also a Golden/Orange Variety and a Purple. While Purple is not too appetizing a color to eat, the Golden/Orange Variety is beautiful. 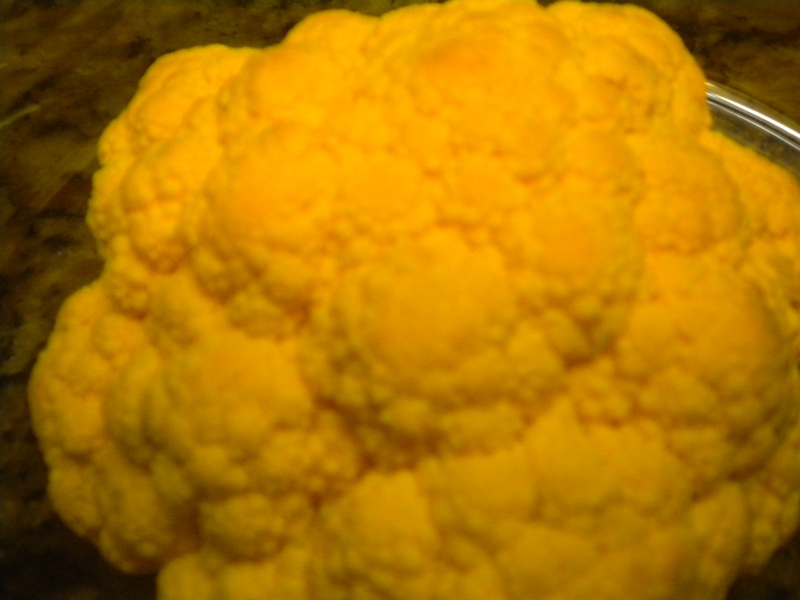 As to taste, all the Cauliflowers taste the same, but if visual appeal influences your taste buds then the Green and the Gold are certainly more appetizing than the plain old white or the purple. I am going to present two appetizing ways to use the Green Cauliflower, but quite honestly this preparation will apply to either color. One nice thing about these recipes is that if you have trouble getting your family to eat their greens or Cauliflower in particular, these preparations will be more enticing to them. For instance, my husband eats very small portions of Vegetables when I prepare them, but he couldn’t get enough of these Cauliflower preparations. He even ate the leftovers for lunch, and eating Vegetable Leftovers is something he very seldom does! So here we go – Green Cauliflower prepared 2 ways! First of all you are going to start with the full head of Cauliflower. Wash it well and then place it in shallow dish such as a glass or ceramic pie plate. Next prepare your Cheese Sauce. There are two ways to do this. One is the easy way and especially good if you are fond of Mayonnaise and aren’t afraid of the Calories! 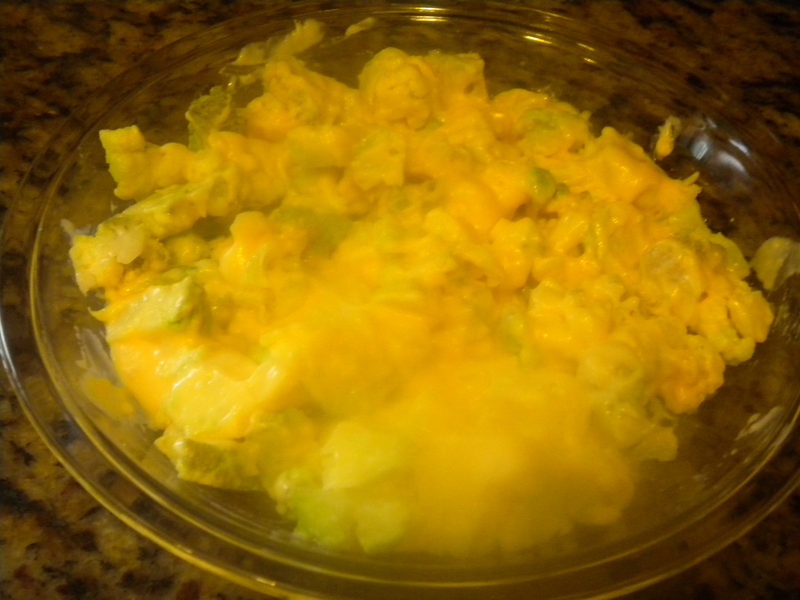 The second way is to prepare a cooked Cheese Sauce which is also very good for other things such as Macaroni and Cheese, etc. In a 2 Qt. Saucepan, melt the Butter and Stir in the Flour and cook until a paste forms. Slowly stir in the Half and Half and cook, stirring constantly until the sauce thickens. Add the shredded Cheddar Cheese and stir constantly until the Cheese melts and the Sauce is smooth. Add the Worcestershire, Salt and Pepper; taste and adjust the seasoning. Right before dinner, place the Cauliflower in the Microwave, uncovered. If you have a Vegetable setting cook it on that but you will have to do at least two times. 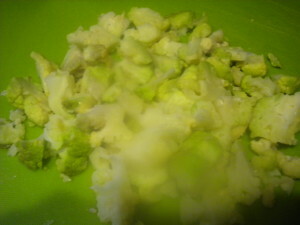 Without the Vegetable setting try cooking the Cauliflower for 5 minutes. When done it should be fork tender. If not, put it back in for another minutes or so. Next spread the Cheese Sauce on top and return to the Microwave for another minute or until the Cheese is thoroughly hot – in the case of the May/Cheese Sauce, you want the Cheese to be almost melted. Bring to the table and serve by cutting the Broccoli into several sections. If you are only two people as we are or if you have Cauliflower leftover from your meal here is another method for preparing it and serving it. If before cooking it the first time you know you are going to have leftovers, double the Cheese Sauce (cooked one) and only use half of it. Roughly chop the leftover Cauliflower, completely removing the florets from the stalk. Discard the stalk. Place the chopped Cauliflower in a buttered Casserole dish; add additional Cheese Sauce as needed and mix gently to completely cover the Cauliflower. If desired, top with Buttered Bread Crumbs and then bake in a 350 degree oven until hot. (About 15-20 minutes) Or cook again in the Microwave. Voila. 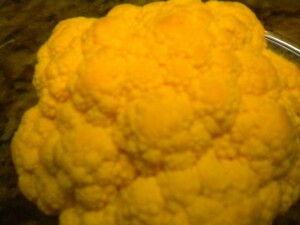 You have another Cauliflower dish similar to the first one but completely different looking. This is an excellent way to get the kids to eat their Green! Try it also with Broccoli.